Beth Davidson, owner of The Dragonfly Shops & Gardens, shows off a handpainted sign created by fellow artist Jeanine Fondacaro, whos artwork is also featured throughout the venue. The vintage 1920s home has been converted into a charming retail boutique. 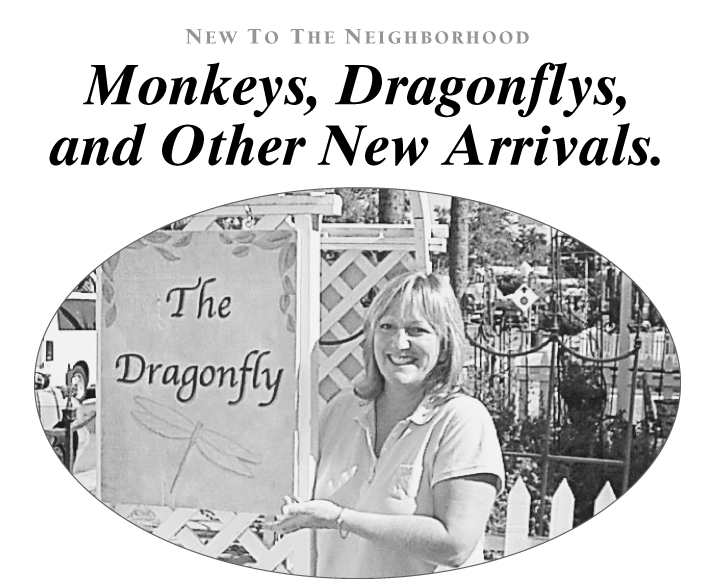 Beth Davidson of Dragonfly Shops & Gardens knows how to bring folks together. Formerly an executive recruiter for 20 years, Beth has assembled an amazing roster of artisans and retailers under one roof at 260 North Glassell next to Rutabegorz. The result is a fascinating mix of offerings that includes plants, jewelry, stained glass, garden art, homemade shawls and hats, classes, workshops, book clubs, refreshments and a place for oldfashioned gatherings. Converted to a retail store, the vintage 1920 home is the former location of longtime Orange retailer, Organic Art Plants. When Beth purchased the home, a convergence of talent began to develop. Visitors who stopped by soon became friends and lent their painting and decorating skills to the project. Some even became vendors. Like one big family, different vendors occupy different rooms. Annalea showcases beautiful stainedglass pieces, while D.J. Giles, brings lovely wraps, shawls and hats to the mix. Anne is The Barefoot Gardener with a nursery in the front, interspersed with garden art & statuary from the Elegant Garden. Linda Kouri Designs features Mark Roberts beautifully crafted fairies.